Fluid Technologies Service provides specialty chemicals as well as whole mud systems. 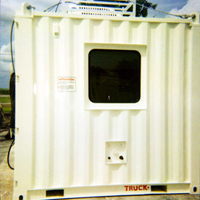 Fluid Technology Service has 8′x8′, 6,500lb Mud Labs available for lease! Welcome to our Products section. We offer all Environmentally Safe and Quality Controlled Products for Workover, Completion, and Drilling Fluid Systems. Below you will find links to each of our products. Please select the product you are interested in to view more information and to download the brochures and datasheets. Feel free to contact us if you have any product or service related questions.